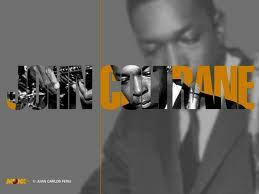 John William Coltrane (AKA, “Trane”; September 23, 1926 – July 17, 1967) was an American jazz saxophonist and composer. Working in the bebop and hard bop idioms early in his career, Coltrane helped pioneer the use of modes in jazz and later was at the forefront of free jazz. He organized at least fifty recording sessions as a leader during his recording career, and appeared as a sideman on many other albums, notably with trumpeter Miles Davis and pianist Thelonious Monk. As his career progressed, Coltrane and his music took on an increasingly spiritual dimension. His second wife was pianist Alice Coltrane, and their son Ravi Coltrane is also a saxophonist. Coltrane influenced innumerable musicians, and remains one of the most significant tenor saxophonists in jazz history. He received many posthumous awards and recognitions, including canonization by the African Orthodox Church as Saint John William Coltrane. In 2007, Coltrane was awarded the Pulitzer Prize Special Citation for his “masterful improvisation, supreme musicianship and iconic centrality to the history of jazz.”Early life and career (1926–1954)John Coltrane was born in Hamlet, North Carolina on September 23, 1926, and grew up in High Point, NC, attending William Penn High School (now Penn-Griffin School for the Arts). Beginning in December 1938 Coltrane’s aunt, grandparents, and father all died within a few months of each other, leaving John to be raised by his mother and a close cousin. In June 1943 he moved to Philadelphia, Pennsylvania. He enlisted in the Navy in 1945, and played in the Navy jazz band once he was stationed in Hawaii. Coltrane returned to civilian life in 1946 and began jazz theory studies with Philadelphia guitarist and composer Dennis Sandole. Coltrane continued under Sandole’s tutelage until the early 1950s. Originally an altoist, during this time Coltrane also began playing tenor saxophone with the Eddie Vinson Band. Coltrane later referred to this point in his life as a time when “a wider area of listening opened up for me. There were many things that people like Hawk, and Ben, and Tab Smith were doing in the ’40s that I didn’t understand, but that I felt emotionally.” An important moment in the progression of Coltrane’s musical development occurred on June 5, 1945, when he saw Charlie Parker perform for the first time. In a DownBeat article in 1960 he recalled: “the first time I heard Bird play, it hit me right between the eyes.” Parker became an early idol, and they played together on occasion in the late 1940s. Contemporary correspondence shows that Coltrane was already known as “Trane” by this point, and that the music from some 1946 recording sessions had been played for Miles Davis—possibly impressing the latter. There are recordings of Coltrane from as early as 1945. He was a member of groups led by Dizzy Gillespie, Earl Bostic and Johnny Hodges in the early- to mid-1950s. Miles and Monk period (1955–1957)The rivalry, tension, and mutual respect between Coltrane and bandleader Miles Davis was formative for both of their careers. Coltrane was freelancing in Philadelphia in the summer of 1955 while studying with guitarist Dennis Sandole when he received a call from trumpeter Miles Davis. Davis, whose success during the late forties had been followed by several years of decline in activity and reputation, due in part to his struggles with heroin, was again active, and was about to form a quintet. Coltrane was with this edition of the Davis band (known as the “First Great Quintet” – along with Paul Chambers on bass, Philly Joe Jones on drums, and Red Garland on piano – to distinguish it from Davis’s later group with Wayne Shorter) from October 1955 through April 1957 (with a few absences), a period during which Davis released several influential recordings which revealed the first signs of Coltrane’s growing ability. This First Quintet, represented by two marathon recording sessions for Prestige in 1956 that resulted in the albums Cookin’, Relaxin’, Workin’, and Steamin’, disbanded in mid April due partly to Coltrane’s heroin addiction. During the later part of 1957 Coltrane worked with Thelonious Monk at New York’s Five Spot, a legendary jazz club, and played in Monk’s quartet (July–December 1957), but owing to contractual conflicts took part in only one official studio recording session with this group. A private recording made by Juanita Naima Coltrane of a 1958 reunion of the group was issued by Blue Note Records in 1993 as Live at the Five Spot-Discovery!. More significantly, a high-quality tape of a concert given by this quartet in November 1957 surfaced, and in 2005 Blue Note made it available on CD. Recorded by Voice of America, the performances confirm the group’s reputation, and the resulting album, Thelonious Monk Quartet with John Coltrane at Carnegie Hall, is widely acclaimed. Blue Train, Coltrane’s sole date as leader for Blue Note, featuring trumpeter Lee Morgan, bassist Paul Chambers, and trombonist Curtis Fuller, is often considered his best album from this period. Four of its five tracks are original Coltrane compositions, and the title track, “Moment’s Notice,” and “Lazy Bird”, have become standards. Both tunes employed the first examples of his chord substitution cycles known as Coltrane changes. One of Coltrane’s most acclaimed recordings, “Giant Steps” features harmonic structures more complex than were used by most musicians of the time. Coltrane formed his first group, a quartet, in 1960 for an appearance at the Jazz Gallery in New York City. After moving through different personnel including Steve Kuhn, Pete La Roca, and Billy Higgins, the lineup stabilized in the fall with pianist McCoy Tyner, bassist Steve Davis, and drummer Elvin Jones. Tyner, from Philadelphia, had been a friend of Coltrane’s for some years and the two men long had an understanding that the pianist would join Coltrane when Tyner felt ready for the exposure of regularly working with him. Also recorded in the same sessions were the later released albums Coltrane’s Sound and Coltrane Plays the Blues. Still with Atlantic Records, for whom he had recorded Giant Steps, his first record with his new group was also his debut playing the soprano saxophone, the hugely successful My Favorite Things. Around the end of his tenure with Davis, Coltrane had begun playing soprano, an unconventional move considering the instrument’s near obsolescence in jazz at the time. His interest in the straight saxophone most likely arose from his admiration for Sidney Bechet and the work of his contemporary, Steve Lacy, even though Miles Davis claimed to have given Coltrane his first soprano saxophone. The new soprano sound was coupled with further exploration. For example, on the Gershwin tune “But Not for Me”, Coltrane employs the kinds of restless harmonic movement (Coltrane changes) used on Giant Steps (movement in major thirds rather than conventional perfect fourths) over the A sections instead of a conventional turnaround progression. Several other tracks recorded in the session utilized this harmonic device, including “26–2,” “Satellite,” “Body and Soul”, and “The Night Has a Thousand Eyes”. In May 1961, Coltrane’s contract with Atlantic was bought out by the newly formed Impulse! Records label. An advantage to Coltrane recording with Impulse! was that it would enable him to work again with engineer Rudy Van Gelder, who had taped both his and Davis’s Prestige sessions, as well as Blue Train. It was at Van Gelder’s new studio in Englewood Cliffs, New Jersey that Coltrane would record most of his records for the label. By early 1961, bassist Davis had been replaced by Reggie Workman while Eric Dolphy joined the group as a second horn around the same time. The quintet had a celebrated (and extensively recorded) residency in November 1961 at the Village Vanguard, which demonstrated Coltrane’s new direction. It featured the most experimental music he’d played up to this point, influenced by Indian ragas, the recent developments in modal jazz, and the burgeoning free jazz movement. John Gilmore, a longtime saxophonist with musician Sun Ra, was particularly influential; after hearing a Gilmore performance, Coltrane is reported to have said “He’s got it! Gilmore’s got the concept!” The most celebrated of the Vanguard tunes, the 15-minute blues, “Chasin’ the ‘Trane”, was strongly inspired by Gilmore’s music. During this period, critics were fiercely divided in their estimation of Coltrane, who had radically altered his style. Audiences, too, were perplexed; in France he was famously booed during his final tour with Davis. In 1961, Down Beat magazine indicted Coltrane, along with Eric Dolphy, as players of “Anti-Jazz” in an article that bewildered and upset the musicians. Coltrane admitted some of his early solos were based mostly on technical ideas. Furthermore, Dolphy’s angular, voice-like playing earned him a reputation as a figurehead of the “New Thing” (also known as “Free Jazz” and “Avant-Garde”) movement led by Ornette Coleman, which was also denigrated by some jazz musicians (including Miles Davis) and critics. But as Coltrane’s style further developed, he was determined to make each performance “a whole expression of one’s being”. The Classic Quartet produced their most famous record, A Love Supreme, in December 1964. It is reported that Coltrane, who struggled with repeated drug addiction, derived inspiration for A Love Supreme through a near overdose in 1957 which galvanized him to spirituality. A culmination of much of Coltrane’s work up to this point, this four-part suite is an ode to his faith in and love for God. These spiritual concerns would characterize much of Coltrane’s composing and playing from this point onwards, as can be seen from album titles such as Ascension, Om and Meditations. The fourth movement of A Love Supreme, “Psalm”, is, in fact, a musical setting for an original poem to God written by Coltrane, and printed in the album’s liner notes. Coltrane plays almost exactly one note for each syllable of the poem, and bases his phrasing on the words. Despite its challenging musical content, the album was a commercial success by jazz standards, encapsulating both the internal and external energy of the quartet of Coltrane, Tyner, Jones and Garrison. The album was composed at Coltrane’s home in Dix Hills on Long Island. The quartet only played A Love Supreme live once—in July 1965 at a concert in Antibes, France. By then, Coltrane’s music had grown even more adventurous, and the performance provides an interesting contrast to the original. Avant-Garde Jazz and the Second Quartet (1965–1967)In his late period, Coltrane showed an increasing interest in avant-garde jazz, purveyed by Ornette Coleman, Albert Ayler, Sun Ra and others. In developing his late style, Coltrane was especially influenced by the dissonance of Ayler’s trio with bassist Gary Peacock and drummer Sunny Murray, a rhythm section honed with Cecil Taylor as leader. Coltrane championed many younger free jazz musicians, (notably Archie Shepp), and under his influence Impulse! became a leading free jazz record label. After A Love Supreme was recorded, Ayler’s apocalyptic style became more prominent in Coltrane’s music. A series of recordings with the Classic Quartet in the first half of 1965 show Coltrane’s playing becoming increasingly abstract, with greater incorporation of devices like multiphonics, utilization of overtones, and playing in the altissimo register, as well as a mutated return to Coltrane’s sheets of sound. In the studio, he all but abandoned his soprano to concentrate on the tenor saxophone. In addition, the quartet responded to the leader by playing with increasing freedom. The group’s evolution can be traced through the recordings The John Coltrane Quartet Plays, Living Space, Transition (both June 1965), New Thing at Newport (July 1965), Sun Ship (August 1965), and First Meditations (September 1965). In June 1965, he went into Van Gelder’s studio with ten other musicians (including Shepp, Pharoah Sanders, Freddie Hubbard, Marion Brown, and John Tchicai) to record Ascension, a 40-minute long piece that included adventurous solos by the young avant-garde musicians (as well as Coltrane), and was controversial primarily for the collective improvisation sections that separated the solos. After recording with the quartet over the next few months, Coltrane invited Pharoah Sanders to join the band in September 1965. While Coltrane used over-blowing frequently as an emotional exclamation-point, Sanders would opt to overblow his entire solo, resulting in a constant screaming and screeching in the altissimo range of the instrument. The more Coltrane played with Sanders, the more he gravitated to Sanders’ unique sound.Adding to the quartet.By late 1965, Coltrane was regularly augmenting his group with Sanders and other free jazz musicians. Rashied Ali joined the group as a second drummer. This was the end of the quartet; claiming he was unable to hear himself over the two drummers, Tyner left the band shortly after the recording of Meditations. Jones left in early 1966, dissatisfied by sharing drumming duties with Ali. Both Tyner and Jones subsequently expressed displeasure in interviews, after Coltrane’s death, with the music’s new direction, while incorporating some of the free-jazz form’s intensity into their own solo projects. There are speculations that in 1965 Coltrane may have begun using LSD-informing the sublime, “cosmic” transcendence of his late period. After Jones’s and Tyner’s departures, Coltrane led a quintet with Pharoah Sanders on tenor saxophone, his second wife Alice Coltrane on piano, Jimmy Garrison on bass, and Rashied Ali on drums. Coltrane and Sanders were described by Nat Hentoff as “speaking in tongues”. When touring, the group was known for playing very lengthy versions of their repertoire, many stretching beyond 30 minutes and sometimes even being an hour long. Concert solos for band members regularly extended beyond fifteen minutes in duration.The group can be heard on several live recordings from 1966, including Live at the Village Vanguard Again! and Live in Japan. In 1967, Coltrane entered the studio several times; though pieces with Sanders have surfaced (the unusual “To Be”, which features both men on flutes), most of the recordings were either with the quartet minus Sanders (Expression and Stellar Regions) or as a duo with Ali. The latter duo produced six performances which appear on the album Interstellar Space. Coltrane died from liver cancer at Huntington Hospital on Long Island on July 17, 1967, at the age of 40. His funeral was held on Friday, July 21 at St. Peters Lutheran Church in New York City. The Albert Ayler Quartet and The Ornette Coleman Quartet respectively opened and closed the service. He is buried at Pinelawn Cemetery in Farmingdale, N.Y.
Biographer Lewis Porter has suggested, somewhat controversially, that the cause of Coltrane’s illness was hepatitis, although he also attributed the disease to Coltrane’s heroin use. In a 1968 interview, Albert Ayler claimed that Coltrane was consulting a Hindu meditative healer for his illness instead of Western medicine, though Alice Coltrane later denied this. The Coltrane family reportedly remain in possession of much more as-yet-unreleased music, mostly mono reference tapes made for the saxophonist and, as with the 1995 release Stellar Regions, master tapes that were checked out of the studio and never returned. The parent company of Impulse!, from 1965 to 1979 known as ABC Records, purged much of its unreleased material in the 1970s. Lewis Porter has stated that Alice Coltrane, who died in 2007, intended to release this music, but over a long period of time; her son Ravi Coltrane, responsible for reviewing the material, is also pursuing his own career. InstrumentsColtrane played the clarinet and the alto horn in a community band before taking up the alto saxophone during high school. In 1947, when he joined King Kolax’s band, Coltrane switched to tenor saxophone, the instrument he became known for playing primarily. Coltrane’s preference for playing melody higher on the range of the tenor saxophone (as compared to Coleman Hawkins or Lester Young) is attributed to his start and training on the alto horn and clarinet; his “sound concept” (manipulated in ones vocal tracts- tongue, throat) of the tenor sax was set higher than the normal range of the instrument. In the early 1960s, during his engagement with Atlantic Records, he increasingly played soprano saxophone as well, famously on the album My Favorite Things. Toward the end of his career, he experimented with flute in his live performances and studio recordings (Live at the Village Vanguard Again!, Expression). Eric Dolphy’s mother supposedly gave Coltrane his flute and bass clarinet after Dolphy’s death in 1964. Religious beliefsColtrane was born and raised in a Christian home, and was influenced by religion and spirituality from childhood. His maternal grandfather, the Reverend William Blair, was a preacher at an African Methodist Episcopal Zion Church in High Point, North Carolina, and John’s paternal grandfather, Reverend William H. Coltrane, was an A.M.E. Zion minister in Hamlet, North Carolina. John’s parents met through church affiliation, and married in 1925. John was born in 1926. As a youth, John practiced music in the southern African-American church. In A Night in Tunisia: Imaginings of Africa in Jazz, Norman Weinstein notes the parallel between Coltrane’s music and his experience in the southern church. In 1955, Coltrane married Juanita Naima Grubbs, a Muslim convert, for whom he later wrote the piece “Naima”, and came into contact with Islam.] Coltrane explored Hinduism, the Kabbalah, Jiddu Krishnamurti, African history, and the philosophical teachings of Plato and Aristotle. Coltrane also became interested in Zen Buddhism and, later in his career, visited Buddhist temples during his 1966 tour of Japan. John and Naima Coltrane had no children together and were separated by the summer of 1963, and not long after that John met pianist Alice McLeod (who soon became Alice Coltrane). John and Alice moved in together and had two sons before he was “officially divorced from Naima in 1966, at which time John and Alice were immediately married.” John Jr. was born in 1964, Ravi was born in 1965, and Oranyan (Oran) was born in 1967. According to Lavezzoli, “Alice brought happiness and stability to John’s life, not only because they had children, but also because they shared many of the same spiritual beliefs, particularly a mutual interest in Indian philosophy. Alice also understood what it was like to be a professional musician”. In October 1965, Coltrane recorded Om, referring to the sacred syllable in Hinduism, which symbolizes the infinite or the entire Universe. Coltrane described Om as the “first syllable, the primal word, the word of power”. The 29-minute recording contains chants from the Bhagavad Gita, a Hindu holy book, as well as Coltrane and Pharoah Sanders chanting from a Buddhist text, The Tibetan Book of the Dead, and reciting a passage describing the primal verbalization “om” as a cosmic/spiritual common denominator in all things. The influence Coltrane has had on music spans many different genres and musicians. Coltrane’s massive influence on jazz, both mainstream and avant-garde, began during his lifetime and continued to grow after his death. He is one of the most dominant influences on post-1960 jazz saxophonists and has inspired an entire generation of jazz musicians. In 1965, he was inducted into the Down Beat Jazz Hall of Fame. In 1972, A Love Supreme was certified gold by the RIAA for selling over half a million copies in Japan. This album, as well as My Favorite Things, was certified gold in the United States in 2001. In 1982 Coltrane was awarded a posthumous Grammy for “Best Jazz Solo Performance” on the album Bye Bye Blackbird, and in 1997, was awarded the Grammy Lifetime Achievement Award. Coltrane was inducted into the North Carolina Music Hall of Fame in 2009. His widow, Alice Coltrane, after several decades of seclusion, briefly regained a public profile before her death in 2007. Coltrane’s son, Ravi Coltrane, named after the great Indian sitarist Ravi Shankar, who was greatly admired by Coltrane, has followed in his father’s footsteps and is a prominent contemporary saxophonist.A former home, the John Coltrane House in Philadelphia, was designated a National Historic Landmark in 1999. His last home, the John Coltrane Home in the Dix Hills neighborhood of Huntington, New York, where he resided from 1964 until his death in 1967, was added to the National Register of Historic Places on June 29, 2007. His revolutionary use of multi-tonic systems in jazz has become a widespread composition and reharmonization technique known as “Coltrane changes”. In 2002, scholar Molefi Kete Asante listed John Coltrane on his list of 100 Greatest African Americans. Coltrane’s tenor (Selmer Mark VI, serial number 125571, dated 1965) and soprano (Selmer Mark VI, serial number 99626, dated 1962) saxophones were auctioned on February 20, 2005 to raise money for the John Coltrane Foundation. The soprano raised $70,800 but the tenor remained unsold. … the Coltrane church is not a gimmick or a forced alloy of nightclub music and ethereal faith. Its message of deliverance through divine sound is actually quite consistent with Coltrane’s own experience and message. John Coltrane is depicted as one of the ninety saints in the monumental Dancing Saints icon of St. Gregory of Nyssa Episcopal Church in San Francisco. The Dancing Saints icon is a 3,000-square-foot (280 m2) painting rendered in the Byzantine iconographic style that wraps around the entire church rotunda. The icon was executed by iconographer Mark Dukes, an ordained deacon at the Saint John Coltrane African Orthodox Church, who has painted other icons of Coltrane for the Coltrane Church. 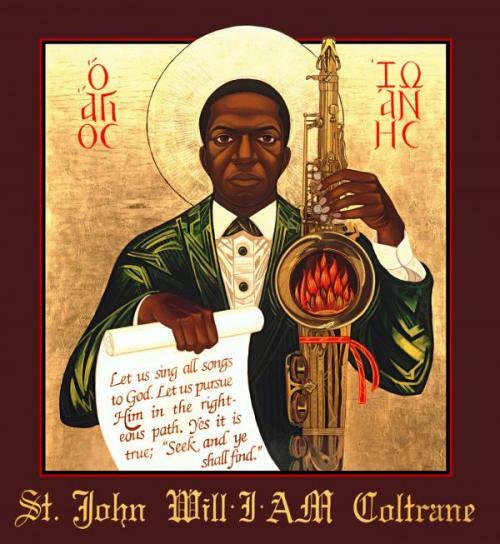 Saint Barnabas Episcopal Church in Newark, New Jersey included Coltrane on their list of historical black saints and made a “case for sainthood” for him in an article on their former website .